I’ve always loved making up stories. When I was about ten, I used to invent all kinds of stories for my younger sister (one day, I really must break it to her that the animal figurines she found under her pillow weren’t really left there by the fairies that lived in our garden!). The farmhouse where we lived had big empty attics where I used to force invite my brother and sister and friends to dress up and stage elaborate plays based on my stories (and ones I’d borrowed from my Once Upon A Time comics). I was the director, of course, as well as the writer. And I usually gave myself the starring role too. Ooh, I was so bossy. But then I didn’t write stories again for many years. I was too busy with college and then with writing serious scientific articles for my job. 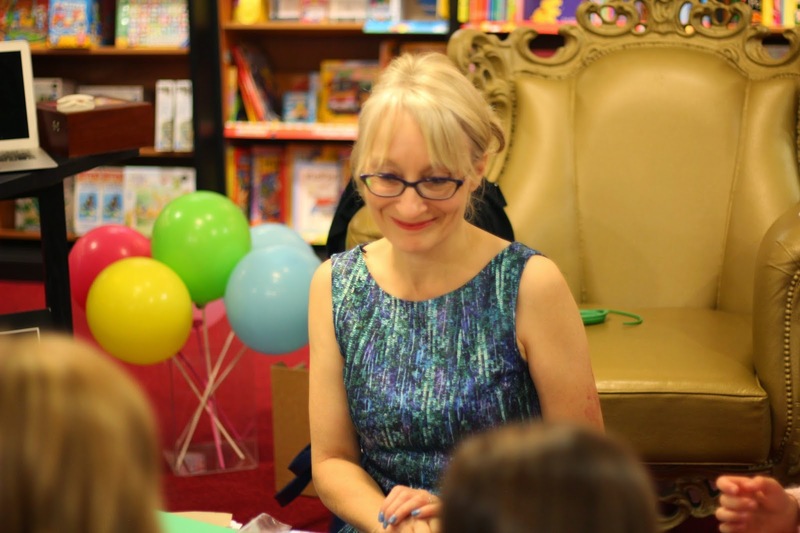 But the story-writing bug hadn’t gone away completely: it had only lain dormant all those years, ready to pop up again some time around my fortieth birthday, yelling ‘Pay attention to me! I’m not going away!’ So I thought I’d better listen to it at last. Most days I try to write all day while my sons are at school/work- after I’ve walked the dogs and fed the hens and tidied up and put a load of washing on. I sit down in my little office next to the front door with a big cup of tea (the first of many!) and get to work. When I’m writing, my office enters some kind of time warp; the hands of the clock whizz round in a speed-blur and it seems like only seconds later that the boys are home from school. Meanwhile my two dogs, Storm and Maia, lie under my desk and do a lot of eye-rolling and impatient sighing to express their displeasure that I am sitting around all day when I could be doing something they consider much more useful - like taking them for another walk. But when my parents’ dog, Snowy, is staying with us for his holidays, he likes to be more hands-on (paws-on?) and help with the writing itself. He sits on my lap (and if you’ve ever tried to type with a fully grown Parson’s Russell on your knee, you’ll know that this is ‘helping’ in only the very loosest sense of the word!) and gives me his valuable opinions. In this picture Snowy is reading over the first draft of The Mystery of The Whistling Caves. Drift is his favourite character of course! Do you do the drawings in Adventure Island? No. Because if I did, they would look like this! The gorgeous line drawings at the start of each chapter are done by the hugely talented illustrator, Leo Hartas. I did offer to do the illustrations myself, but for some reason the publisher turned me down. Can’t think why, can you? Do you base the characters in Adventure Island on real people? I know what you’re really asking! Is there a real Mrs Loveday walking around out there somewhere, and if so, how can we make sure we avoid her? Don’t worry, Mrs Loveday isn’t real! But I do take little bits of people I know (or even just see in on a bus or a train), exaggerate them and mix them up in a sort of blender in my head. It’s like making a character smoothie really. Mrs Loveday’s mix-ups, Old Bob’s bushy eyebrows, Pete Morley’s tattoos, Aunt Kate’s cakes, Sid Golding's shouting, Scott’s fear of cows, Mr Piggott’s lectures...they’re all bits of people that have gone into the smoothie maker! 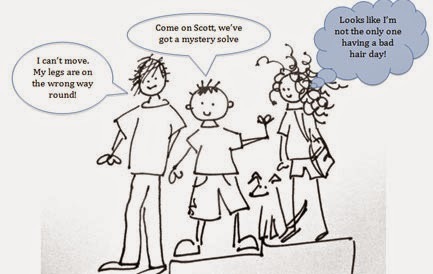 But Scott and Jack do have some things in common with my two sons; one is cool and laid-back, the other brave and something of an expert on cake and ice-cream! I don’t have a daughter, but Emily is really the girl wish I’d been myself (I did go in for a lot of writing plans in notebooks, but I was nowhere near as clever or brave or resourceful as Em!). Sadly, these days I’m probably more like Mrs Loveday! I’m a hopeless eavesdropper and I’ve even started getting my words mixed up now and then...if you catch me wearing a pink bicycle helmet and starting every sentence with “I’m not one to tittle-tattle...” you will tell me, won’t you? 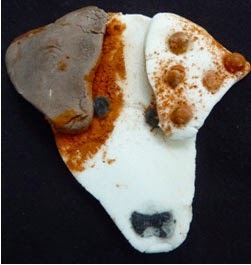 Oh, and I did pinch Drift’s ears (one black, one white with brown spots) from a real person too (well, a real dog). You can’t really see Snowy’s ears in the photo above where he’s sitting on my knee, so here is a clearer view of those lovely ears. This isn’t a real photo of Snowy, of course! This is a portrait of Snowy that I crafted out of icing for a birthday cake for my youngest son about ten years ago! The black bits are done with food colouring and the brown is cocoa powder. I’ve often asked myself why I’ve kept this icing sugar dog’s head in a little plastic box in the kitchen all this time. Now I know why. It was destined for a web page appearance! 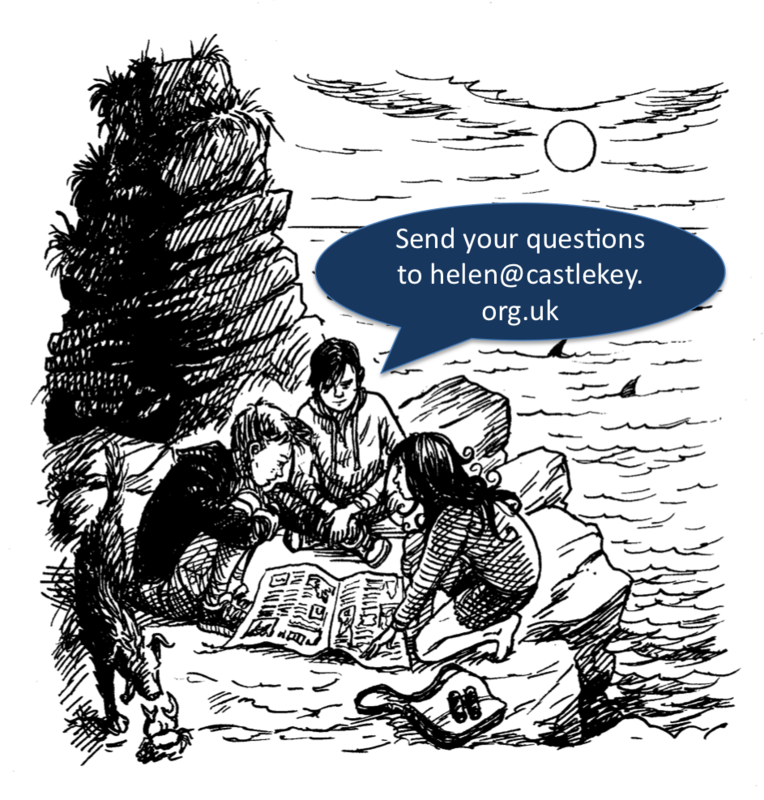 Is Castle Key a real island? Like many of the best places, Castle Key only exists in our imaginations. You won’t find it on any maps (except the one in the Adventure Island books!) 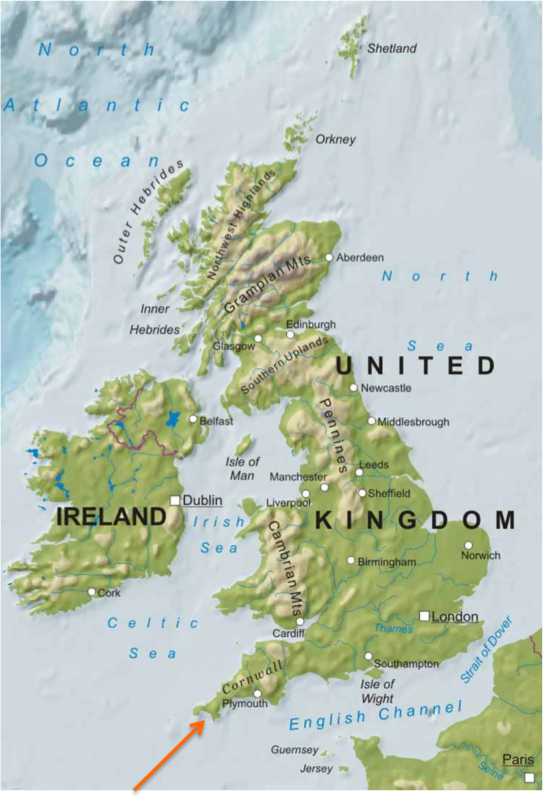 But if it did ever appear on a real map it would be somewhere off the coast of Cornwall. Cornwall is a beautiful place, full of adventure, and it is somewhere that reminds me of childhood holidays. In Castle Key island I’ve tried to capture all those things – and its own special magic too. What were your favourite books when you were younger? I adored Enid Blyton books - as you can probably guess! 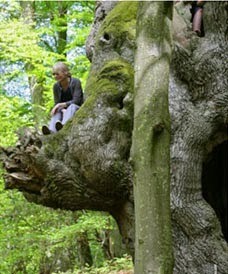 The Faraway Tree was a special favourite – in fact, I think I finally found the real Faraway Tree deep in the woods in Shropshire not long ago. 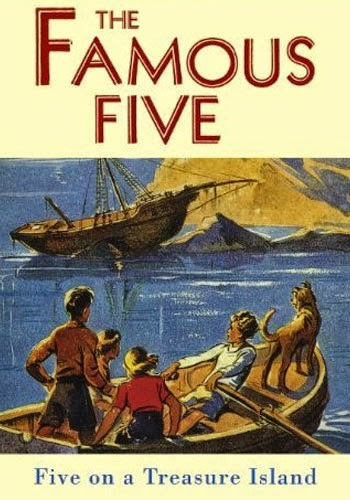 Then I moved on to Secret Seven, Famous Five, Five-find-Outers and Dog, Adventurous Four (I had to check I wasn’t imagining that last one as I’ve never seen it since, but it really did exist). What brilliant stories they all were! I was also a big fan of the Chalet School series by Elinor Brent-Dyer, The Secret Garden by Frances Hodgson Burnett and Little House on the Prairie by Laura Ingalls Wilder. And I had a soft spot for Rupert The Bear Annuals (although that was mainly because of the pictures). I really wanted to be Rupert! His best friend is a badger, he never seems to have to go to school, his world is full of magic, and he gets to wear bright yellow trousers! What’s not to love? When I was a bit older, I loved My Family and Other Animals by Gerald Durrell, Watership Down by Richard Adams (Bright Eyes still makes me cry) and I Capture The Castle by Dodie Smith. I remember The Owl Service by Alan Garner made a huge impression on me (which is code for saying it scared me silly – in a good way!). Have you written any other books apart from Adventure Island? Yes! I have written a new series called Secrets of the Tombs. These are adventure/mystery books with a teenage boy called Ryan and girl called Cleo as the main characters. The books are set in the present day, but they have an archaeological theme and deal with mysteries that happened a long time ago as well as current crimes. 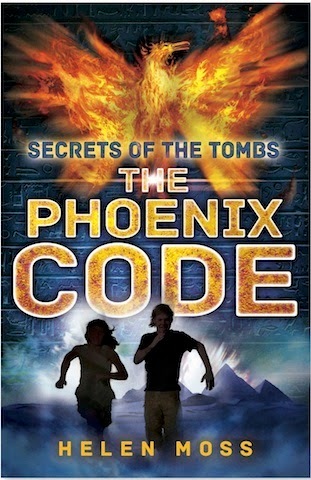 The first book, The Phoenix Code, is set in the Valley of the Kings in Egypt, the second, The Dragon Path, is set in China and the third will come out in 2016. You can find out more about them on the Secrets of the Tombs website. I have also written a series of four books called Superstar High under the name Isabella Cass. These are all about three girls, called Holly, Cat and Belle who follow their dreams and have lots of fun adventures at an international stage school in London. You can find out more about them on my website, here. I have a short story in a new mystery collection called Mystery and Mayhem, edited by Katherine Woodfine. My story is called The Mystery of the Pineapple Plot is set in the eighteenth century and involves something very suspicious happening to a rather special pineapple. I like to go for long walks in the countryside with my two Border Collies, Storm and Maia. I also like to run (sometimes I even do half-marathons) and play netball. 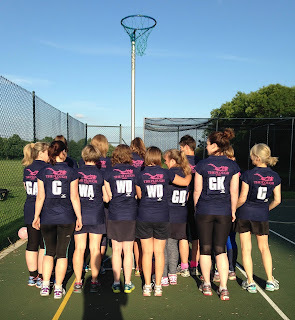 I play in a local netball team with lots of my friends and we have great fun. Writing involves a lot of sitting down, which makes it important to get some exercise! With my netball club - that's me on the right! I have a lovely husband and two amazing grown-up sons who are at University and College. I love to spend time with them. One of our favourite things to do is ski together whenever we have the chance. Of course, I LOVE to read too. If you have any more questions, do send them in and I’ll do my best to answer them!